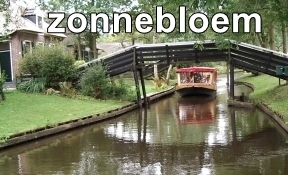 Boattrips with captain through the picturesque part of Giethoorn, situated in nature environment De Wieden. All our skippers are in possession of a boating licence and speak English, German and of course the local dialect. 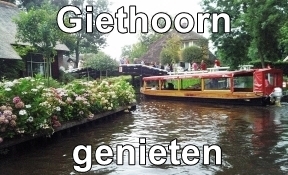 They tell you what's to know about Giethoorn on the route. 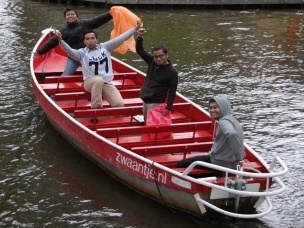 Tourboat no. 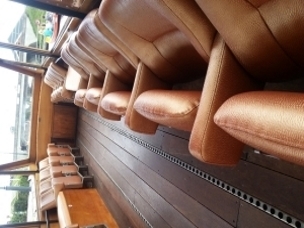 2 has also an audio system on board with 8 languages (Dutch, German, English, French, Spanish, Chinese Mandarin, Russian, Arab) or use the free app exclusively for our guests on one of the other tourboats. The big boats are closed, covered and are heated on cold days. With summer temperatures all windows can be flipped open and a part of the sliding roof, so even on the hottest day's you will always have a roof over your head to protect you against the sun. 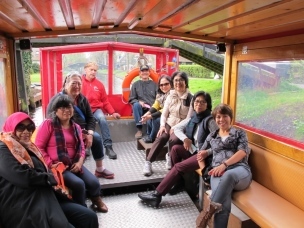 The standard boattour takes about 1 hour and follows the tourist village route through the narrow canals and under the bridges. This cruise has fixed departure times and is for both groups (booking recommended) as individual visitor's. Individual guests do not need to sign up but full = full. Tickets are available at the box office or (cheaper) online, see info at the bottom of this page. With an online ticket your seat is guaranteed. Embarkment departure timetable further down this page. 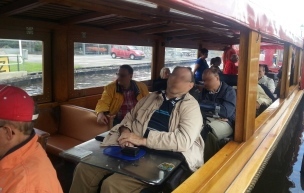 When your group is too large for the maximum number of persons per boat, a 2nd or even a 3rd canaltourboat will be driving at the same time (up to ± 175 persons at the same time); This is automatically scheduled by us. Indicator number of wheelchairs is depending on size. Individual ticketholders are allowed also. 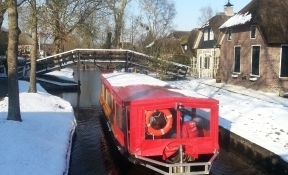 Unique in Giethoorn: all our traditional Gieterse excursion boats sail with electric motor using solar power. 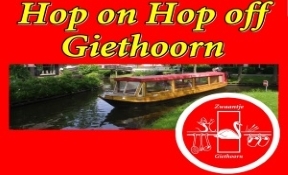 Hop on Hop off Giethoorn: Dayticket valid on city and or nature tour, different stops in the village. 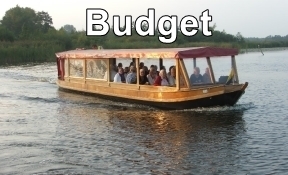 (the watertaxi is not for indivuduals only groups) The group accommodation Samen Een or the Kraggehuis are only accessible by boat. We take care of the transport of the group and luggage to these locations. Tourboat up to 44 persons including 1 wheelchair. Equipped with tables and padded seats with backrest (sitting area) and elevator. 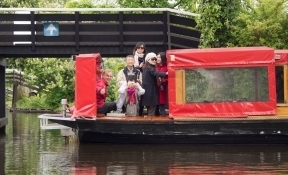 Lounge canalboat with upholstered sofa with backrest, round seat setup, with wheelchair lift, max. 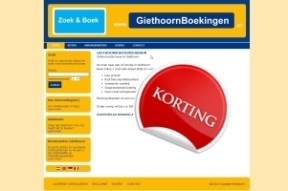 40 persons including ± 8 (also electric) wheelchairs. This boat is equipped with an extra large electric lift accessible for the heaviest wheelchairs, scootmobil or stretcher. Even bedbounded people can easily on board with this lift. The boat has a capacity of ± 45 people. 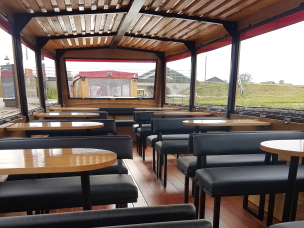 There is room for about 15-20 wheelchairs; guidance, family members, individual ticket holders, can take place on the upholstered benches with backrest (new 2014). Sittings are flexible installed: behind each other, in front of each other, creating more space for wheelchair etc. Like boat 3 but with platform lift for several wheelchair users. 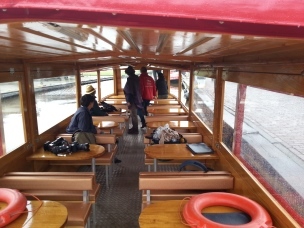 This boat is decorated with comforable theatre seats in round seat. 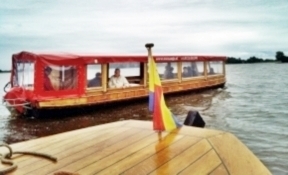 Tourboat up to 48 persons, multiple wheelchairs possible. Equipped with tables and padded seats with backrest (sitting area) and elevator.